Figure skating is a physically demanding sport. 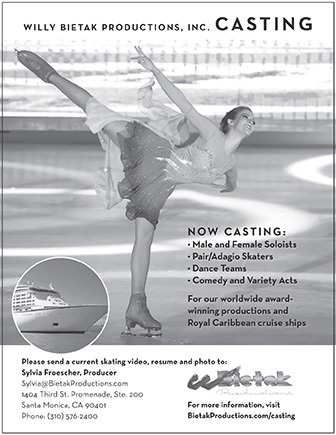 Delivering a singles, pairs or ice dance program requires a high skill level to effectively execute the various spins, jumps, sequences and holds while making it look graceful and effortless. When jumping, skaters can experience landing forces exceeding 10 times their body weight: a 50-kg (approximately 101-pound) skater could experience momentary landing forces greater than 500 kg (more than 1100 pounds). For strength and conditioning coaches, these elements provide some interesting challenges. Competitive skating in general is much like gymnastics in that the athletes learn the skills at a young age. This situation puts skating into the early specialization category of sports when considering long-term athlete development. At an age when most children are enjoying a variety of physical activities and learning movement through play, skaters are already beginning to specialize in the sport. this repetition in itself places a great demand on the body. A strength and conditioning program should include the development of robustness to help the athlete meet the demands and rigors of training, as well as improve performance in competition. It is also essential that the athletes obtain a movement assessment. An assessment can highlight any potential injury risks as well as any developmental or physical requirements, such as strength or power deficits or muscle imbalances that can impact future development or performance. Female athletes participating in sports that involve jumping and landing are at a higher risk of serious knee injuries. Non-contact anterior cruciate ligament (ACL) injuries are among the most debilitating. Skaters can reduce the risk of these injuries by strengthening specific muscles and establishing correct movement patterns. Ensuring that the hamstring muscles are strong through both hip extension and knee flexion will help to reduce the risk of knee shear, which occurs when the tibia, or shin, is pulled forward incorrectly by the quadriceps. Activating and strengthening the gluteus medius and maximus muscles will help to reduce internal rotation of the femur, in which the knees come in across the midline of the body on take off and landing of jumps. The combination of these muscle weaknesses and poor movement patterns increases the risk of an ACL injury. Increasing the strength and power of both these muscle groups can reduce that risk and increase athletic performance. Younger athletes can start this strengthening program by using exercise bands; clamshells target the gluteus muscles, and hamstring curls and body-weight single-leg deadlifts target the hamstrings. The squat is also a great exercise for skaters, young or old. Learning the squat as a body-weight exercise strengthens most of the key lower-limb muscles used in skating. The body-weight squat can progress to a squat jump to increase strength and power or a single-leg squat (in which the body resembles a teapot) to increase lower-limb strength and balance. Without sound exercise technique, any effective progression will be limited and potentially lead to injury. It is essential that a coach adhere strictly to this mantra, especially when working with young athletes who are just starting strength- training programs. Tim Silvester is a UKSCA accredited strength and conditioning coach who conducts seminars around the world for athletes at all levels. He can be reached at tsilvester@getcoached.net.